How Do You Measure For Window Screens? We are sure that you are excited to order your custom window screens. However, you must measure correctly, otherwise your new window screen won’t fit properly and will do you little good. Here, you will find all that you need to know about measuring for your replacement window screens. However, if you have any questions about ordering your custom window screens, contact us by calling, emailing, or chatting us! We would be happy to help you order your new window screens! The simplest way of measuring for new window screens is to use one of your existing screens of the same size. If you live in an apartment or tract housing, and don’t have a screen of your own, you may be able to measure a screen from your neighbor who has the same window size. When you are ordering your replacement window screen, you must provide the width and length of your screen, as well as the thickness of window screen frame. Step 1: Measure the Shortest Side First, you will want to measure your window screen’s shortest side. Measure your window screen to the closest 1/16 inch. Step 2: Measure the Longest Side Next, measure the longest side of your window screen. Again, you will want to measure it to the closest 1/16 inch. 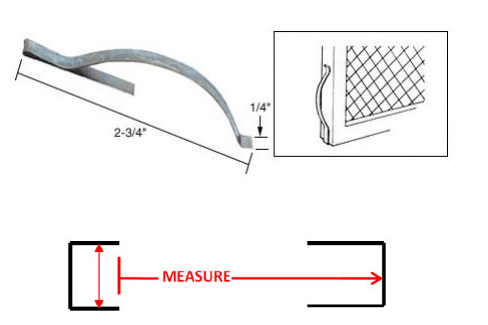 Step 3: Measure the Frame Thickness You would think you would be done, but when you are measuring for replacement window screens, you must also measure the thickness of your screen’s frame. Once you know the measurements of your window screen, you can select the proper hardware to install your window screen. If you are unsure which side of your window screen is which, or you have an odd-shaped screen, contact the Metro Screenworks team! We would be happy to help you figure out how to measure for your window screen. How Do I Measure a Window If I Don’t Have a Screen? If you don’t have an old screen to measure, do not despair! If other windows of your home have the same size window, then simply pop out one of those screens and measure it. If your neighbor has the same size window, you can ask to measure their screen or window. However, if you don’t have and old screen to measure, you can still purchase a replacement window screen; you will just have to measure for it differently. The “lip” of your window is what will hold your window screen in place. Place the end of the tape measure behind the lip and measure vertically up to the window screen channel. You will want to find the measurement and then add an ⅛ of an inch. When you measure the horizontal screen channel, you will want to find your measurement and then subtract an ⅛ of an inch. This common measuring technique works for most windows. However, there are some types of window screens that require a different means of measuring. Step 1: Find the u-shaped channel that’s shallower on one side than the other. Step 2: This is the lip. Measure as you would traditional windows. Step 3: Subtract an 1/8 of an inch from width and height. Step 1: Measure from outside edges to the center of the mullion. Step 2: Then get the vertical measurements as you would with a traditional window. Step 1: Confirm there is space for screws. Step 2: Measure to outside edges of window screen (height and width). Step 2: Subtract ⅛ inch. Step 1: Measure brick to brick. Step 2: Subtract 1 inch from width and height. 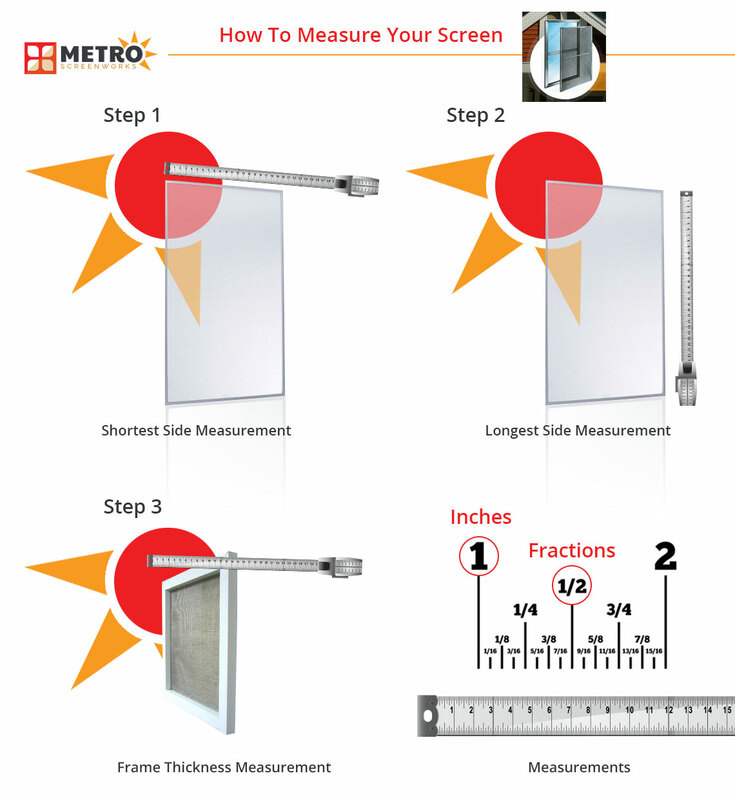 If you have any questions about how to measure for your replacement window screens, please contact us. We would love to help you get the screens that you need and would love for years to come. How Do I Choose Window Screen Hardware? Once you determined the window screen size that you need, it is time to select which hardware or screen clips are needed and where they are located on the screen (which side and how far from the edge of screen). The most common types of window screens have tension spring hardware. Below is a drawing of how you would measure for this type of screen. Pull tabs will go on the opposite side of the tension springs. Springs go on the side where the screen fits into the deepest channel. Need help measuring? Click Here!